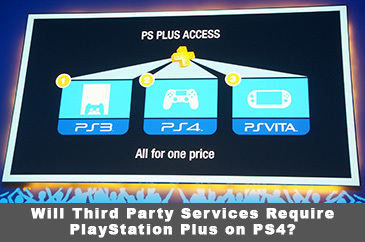 » Will Third Party Services Require PlayStation Plus on PS4? I look back on this generation of consoles, the PlayStation 3, the Xbox 360 and the Wii, and I see a common denominator between them. Something that wasn’t available in prior consoles and represents the slow transition that game consoles are making (some faster than others) towards being entertainment hubs for movies, music and games. One of the biggest elements of this transition was the inclusion of Netflix’s streaming service. This service, which allowed Netflix subscribers to view movies and TV shows instantly across a streaming connection, first came to consoles in 2008 on the Xbox 360 and then spread to PlayStation 3 and the Wii over the following years. There was a major caveat though, you see Microsoft required consumers to have both a netflix subscription (makes sense) and a Xbox Live Gold Subscription, (Doesn’t make sense) in order to watch Netflix. So, to summarize, consumers would have to pay sixty dollars for a year subscription to Xbox Live in addition to their Netflix subscription of choice. Other services followed suit, Amazon Video, Hulu Plus, and others all jumped on the bandwagon. And again, Microsoft was charging for a subscription to themselves in addition to whatever these third parties required. Luckily, Sony wasn’t as money hungry. You see, when PlayStation 3 received netflix, all you needed was a subscription to Netflix and you were good to go. The same went for Amazon Video, Hulu Plus, and any other services. No additional subscriptions required. Wow, what a concept! This is all well and good, but what about PlayStation 4? If there’s one thing I know about Sony, it’s that they always seem to have their head on straight. With PlayStation 4, all of your account information will carry over. Your PSN I.D and your friends list will all be safe and sound on the new system. At launch, PlayStation 4 will be ready to give you all the services you remember and even some new ones to boot. And the best part? None of them will require PlayStation Plus! I say again, what a concept! Yes, that’s right, PlayStation 4 is bringing you the hottest new Free to Play games, online multiplayer and all. It’s quite the flavor and these lovely titles will be available to everyone, even those without a PlayStation Plus subscription. So that means if you need a multiplayer fix, but don’t have the cash for Plus, you can boot up one of these games and play for free. And hey, if you like it, you can expand the experience by buying what you want, when you want it. It all comes to you in convenient bite sized pieces. It’s an interesting model and one that I personally am happy to see making a surge on PlayStation 4. The following titles will be available to play, without a subscription required. Here we have a sleek and fast paced third person shooter featuring eleven different mission types for online cooperative action. Your character has a wide variety of maneuvers and methods for traversing the environment. All this, and you have super powers! Did I mention it’s free? A comic book fan’s dream, or a superhero’s worst nightmare? It’s your call in DC Universe Online. Create your hero or villain, choose your side, and explore a massive world filled with quests and random events. Most of the content is available for free, and by the time you’re ready to buy, you’ll have amassed a wealth through your fan’s donations, or from the banks you’ve robbed. Either way, the initial ticket price is nada! They usually call these types of games Massively Multiplayer, but in this case, it’s literal. Planetside 2 features incredibly large battles with thousands of players duking it out at once! Epic, and still free. Combat based flight simulators are rare. Massively Multiplayer ones are practically nonexistent. War Thunder brings this hybrid to the PS4 with realistic and true to life battlefields of air combat. Time to scratch that itch you didn’t know you had. Oh, and don’t worry, it’s on the house, (That means it’s free, which I’ve never understood that phrase). So it may not have the best name, but hey you’re not paying for the name, in fact, you’re not paying at all! (see a trend here?) Blacklight is another free to play massively multiplayer first person shooter that brings a few new elements to the table. It has a robust customization system, several high tech sci-fi devices you can utilize, and it’s all free! So let’s be honest here, you’re going to want PlayStation Plus. But hey, you’re dropping four hundred dollars or more on a video game console so Sony has your back. For the times you don’t have PlayStation plus, you can still access your netflix, your hulu, and you can play a bunch of awesome multiplayer titles for absolutely free! They usually say this about dogs, but I’m going to go out on a limb here and say that Sony is in fact, man (and woman’s) best friend. Do you use services like Netflix and Hulu Plus? Do you plan on trying out some Free to Play titles on PS4? Tell us in the comments! It seems as though every article written for the Playstation community concerning it's subscription fees, is handled with kids gloves. As if gamers today are gun shy about a monthly fee for online play. We all know xbox 360 killed the PS3 largely due to xbox live. It's a juggernaut, and any gamer worth his or her salt had and has no problem paying for live. If Sony can create the same stable online network as live, then nobody will have a problem paying for it. So come on peeps, tell it like it is. If we as gamers want the greatest experince in gaming, then it will be at the cost of a monthly subscription. We may, from time to time, find some hidden gem that is an offline game, but lets be honest shall we, almost very great game is online.